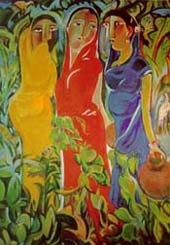 Quamrul Hassan (1921-1988) was a Bangladeshi artist. Hassan was born in Kolkata, India. 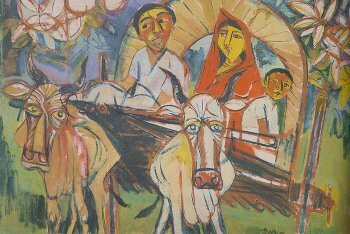 In Bangladesh, Hassan's fame as an artist is perhaps only second to that of Zainul Abedin. Hassan is often referred to in Bangladesh as Potua, a word usually associated with folk artists, due to his down to earth style. In addition of his artistic legacy, two of Hassan's work have come to be part of Bangladesh's political history. The first of this is a monstrous rendiiton of Yahya Khan, the Pakistani president who ordered genocide in Bangladesh. The second was just before his death, mocking the then dictator of Bangladesh, Hossain Mohammad Ershad. This skecth was titled Desh aaj bisshobeheyar khoppre (Our land is now in the hand of the champion of shamelessness). Hassan was born in Kolkata, where his father, Muhammad Hashim, was superintendent of the a local Graveyard. Quamrul Hassan studied at Calcutta Model ME School, Calcutta Madrasa ana later in the Government Institute of Arts, also in Kolkata. He graduated in Fine Arts in 1947. Hassan was very interested in physical exercise and in 1945 became the Bengal champion in a physical exercise competition. During the Pakistan movement, he became involved with it like many other muslim young men of the time. After the Partition of India, Quamrul Hassan came to Dhaka which was then the capital of the eastern part of the newly founded Pakistan. Together with Zainul Abedin, he established the Government Institute of Fine Arts (at present, the Institute of Fine Arts) in 1948. 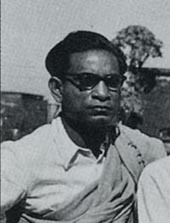 Politically active with leftist inclinations, Hassan was involved in the long political process that led to the creation of independent Bangladesh. He partook in the non-cooperation movement against Ayub Khan in 1969. During liberation war he served as the Director of the Art Division of the Information and Radio Department of the Bangladesh Government in exile. He also designed the Flag of Bangladesh. Hassan died in February 2, 1988 after suffering a massive heart attack while attending the National Poetry Festival. He was buried beside the central mosque of the University of Dhaka. Quamrul Hassan chose to give the folk art tradition a breath of life by incorporating modern ideas in it. Hassan was a versatile artist working in practically all media-oil, gouache, watercolors, pastel, etching, woodcut, linocut, pen and pencil. 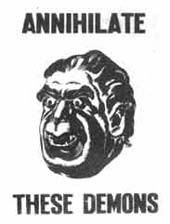 He also worked with woodcuts, specially after the famine of 1974, works that expressed his rage and anger. Quamrul used snakes, jackal, owl to portray the evil in humans, both in his polictical work and his famine work. Rural women and their plight is another theme Hassan has repeatedly worked on. His treatment of women emphasize the bond between them, most of his paintings of women are of a group of women, only rarely a solo painting can be found. However, he mizes romanticism with realism; the strong curved lines and the contrasted use of color contribute to a sensuous appeal that blunts the edges of harsh reality.